Today I bring you the wonderfulness of blushers and bronzers! I hate leaving the house without some kind of colour on my cheeks, and these are the products I use! The Avon Illuminating Pearls are a strong favourite of mine, they give the perfect amount of highlight and colour to the cheeks, a brilliant 2-in-1 highlight and blush. A slightly different shade of blush for me is the Kelly Brook Blush in Bardot – a lot more pink rather than peachy. This is a shimmery blush in the pan, but comes out a lot more subtle on the cheek. Avon Bronzing Pearls are my favourite things to use in the summer months. These certainly aren’t for contouring, but perfect to replace blush to give a bronzed, glowy look. My preferred Kelly Brook blusher is Kelly Brook Blush in Raquel. This is more my shade, a light peachy-coral colour with a beautiful shimmer in. A very natural blush. I don’t seem to get on well with the Bourjous Cream Blush, I’ve tried it multiple times and the colour is gorgeous, I just find it so hard to work with since it’s hard to blend. 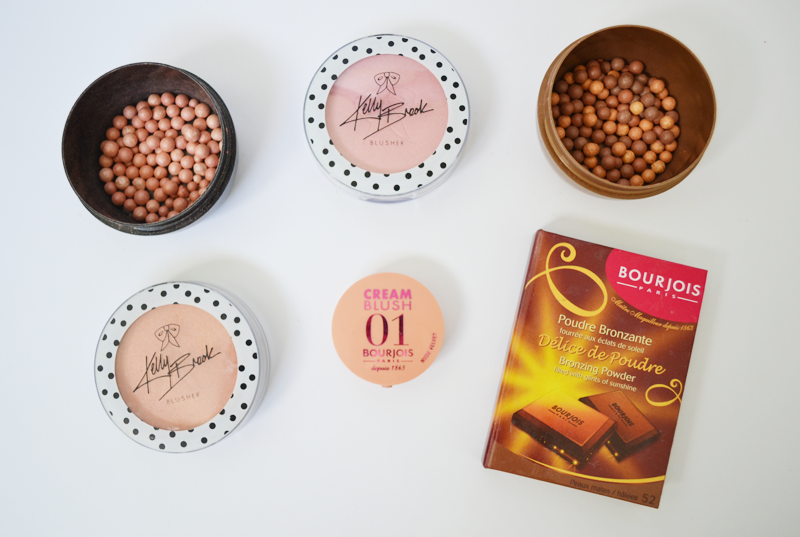 The Bourjous Bronzing Powder is a highly raved product in the blogosphere and I use it a lot to warm up my face. It’s a brilliant bronzer that’s not too orange! I also use two more products that aren’t featured in this photo. First is the Sleek Face Contour Palette, and I adore this, particularly the bronzer and highlight. The pink is a slightly darker pink with gold shimmer in, the bronzer is the perfect subtle warmer-uppper-of-the-face and the highlight is also a very subtle but gorgeous finishing touch. Finally, my all time favourite blusher is Benefit Coralista. It’s a stunning peachy/coral with slight shimmer in and looks so natural I just love it. I have 2 posts more for my Lucy’s Make-up series. Next week will be eyeshadows! What are your favourite blushers and bronzers?